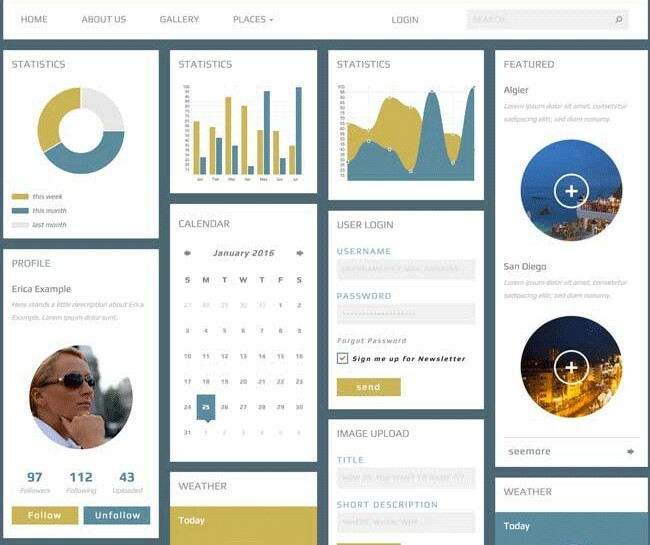 UI kits are a great way to jumpstart your next wireframing project or layout design. 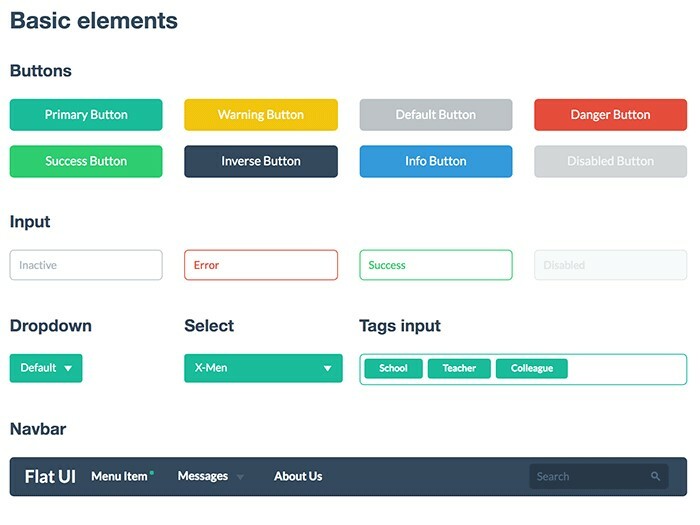 The best kits include a full set of user interface elements, ranging from simple buttons to complex, prefabricated page elements. 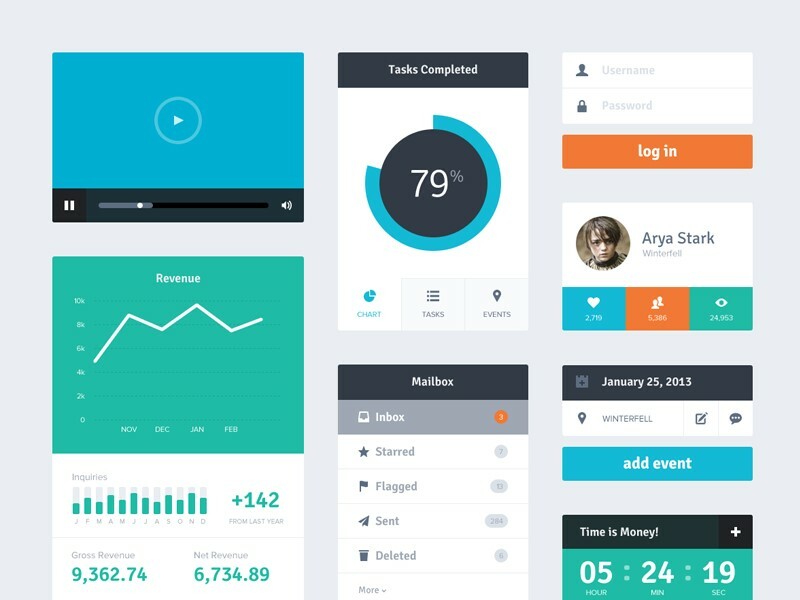 Here’s some flat design UI packs you can use to jump on the latest trend and create bold, modern designs. 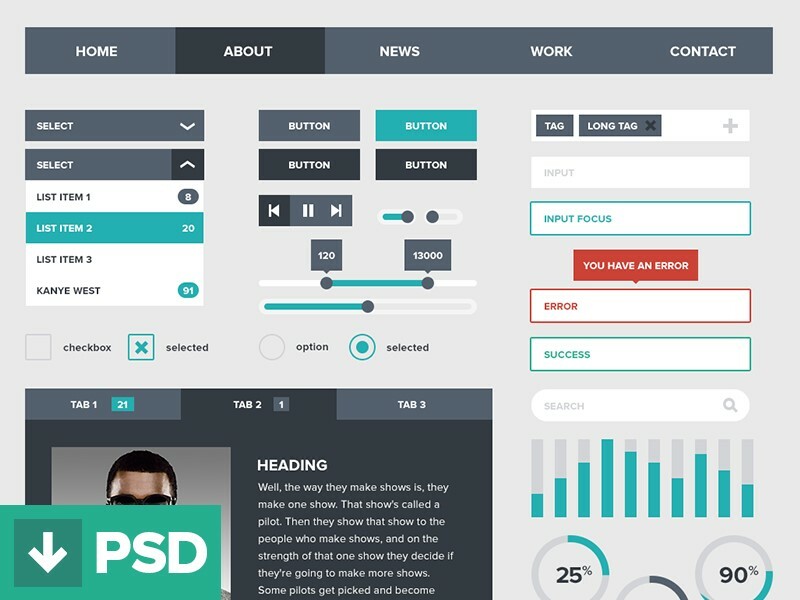 Most of them are PSD kits, but a few come as ready-to-use HTML and CSS. 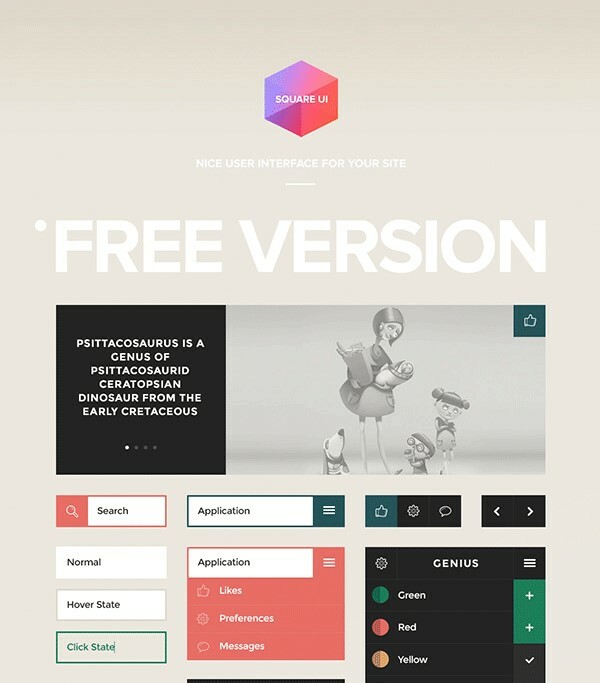 For a free pack, The Flat Design UI Pack contains a surprisingly complete set of UI elements. 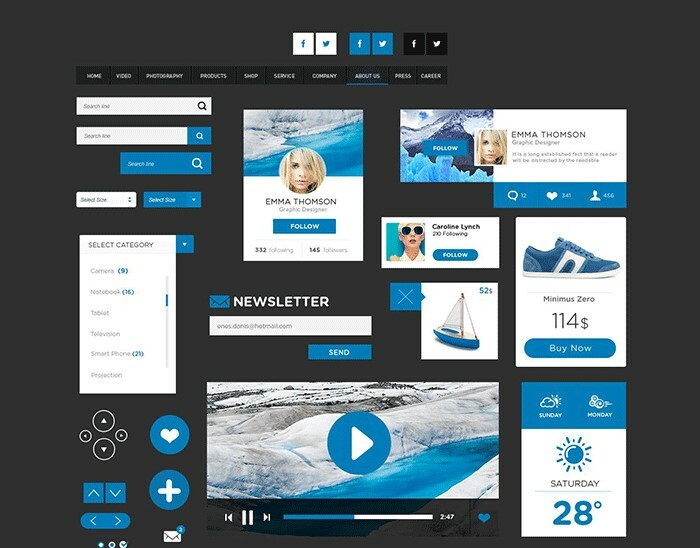 You’ll find a wide array of buttons, icons and navigation elements, as well as premade features like dropdowns, headers, profile pages, weather packs and more. One downside: it relies on Gotham Rounded for most text, so you’ll need to have that (fairly expensive) typeface on your computer before you do any major redesigns. 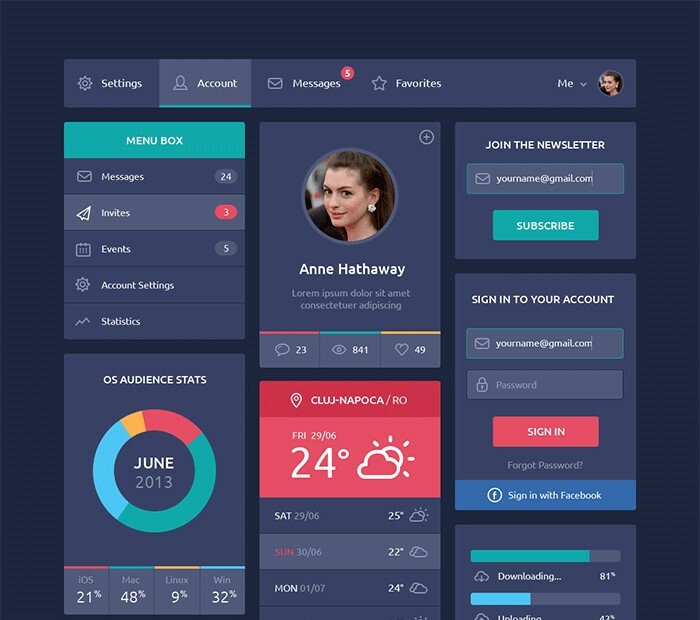 Flat Rounded Square UI Kit is one of the few UI kits that includes both basic elements and full-bore layouts. It’s filled with beautiful, ready-to-ship design elements that can be easily dropped into your new project. 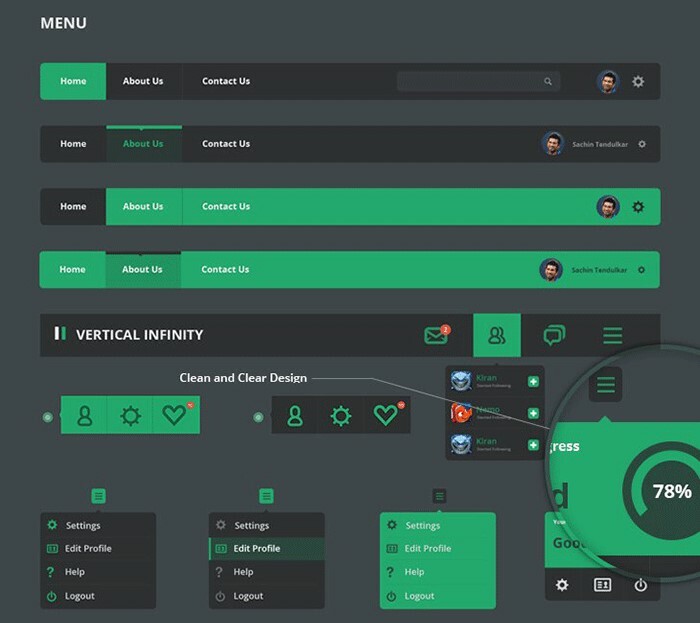 It includes complex layouts like comments pages, video players and carousels, as well as simple elements like multi-color buttons and a themed icon set. Vertical Infinity is all about the basic elements of wireframing. 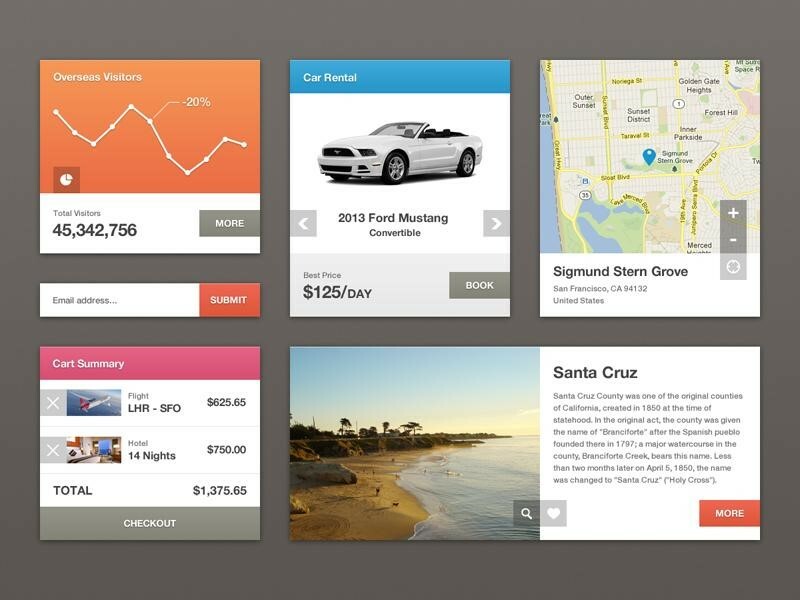 The UI kit is made up almost entirely of individual elements, like drop downs, nav items and menu bar. There’s a huge set of Retina/HiDPI-optimized resources in a many colors, and the green color can easily be swapped out for others in Photoshop. The pack is absolutely massive, with just about every UI element you could hope for isolated and ready for use. An amazing tool for anyone starting a new layout. 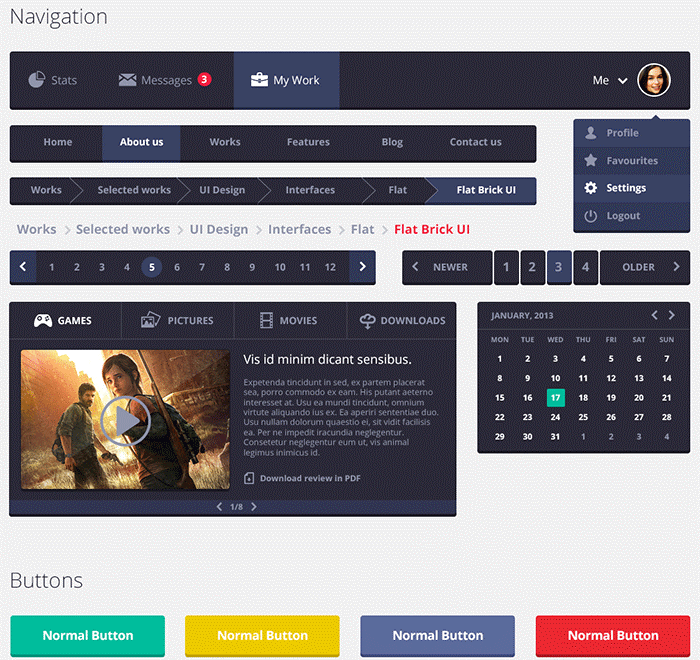 Square UI is the free version of Design Modo’s excellent Square UI pro kit. It’s an attractive, modern collection with a great set of professional features, like multiple states for text boxes and buttons. 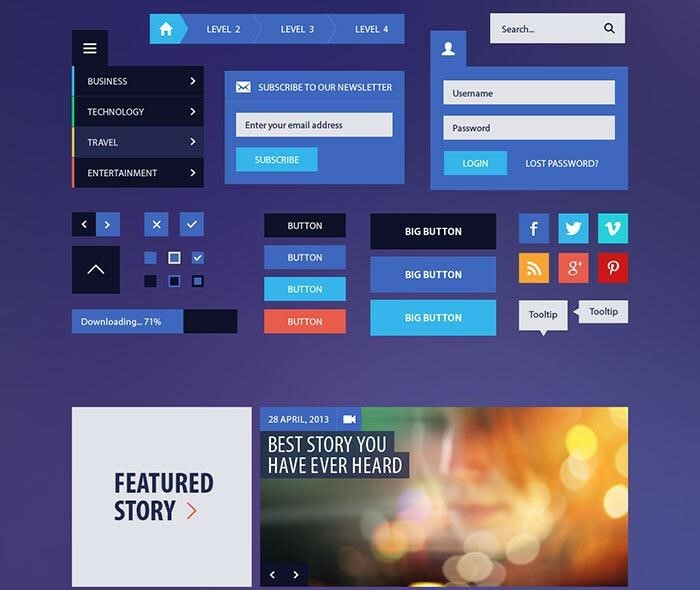 Flat UI Kit is a colorful and complete set of UI elements. It’s cheerful color scheme is great for livening up dull projects, with 20 different themed colors to fill any need. The kit is heavy on professional-grade basics that you can mix and match to create your own designs, but doesn’t include much in the way of pre-built layouts. It also comes in the form of HTML and CSS, rather than PSD files, making it easier to push to production. Some flat design kits are a little more flashy than others. 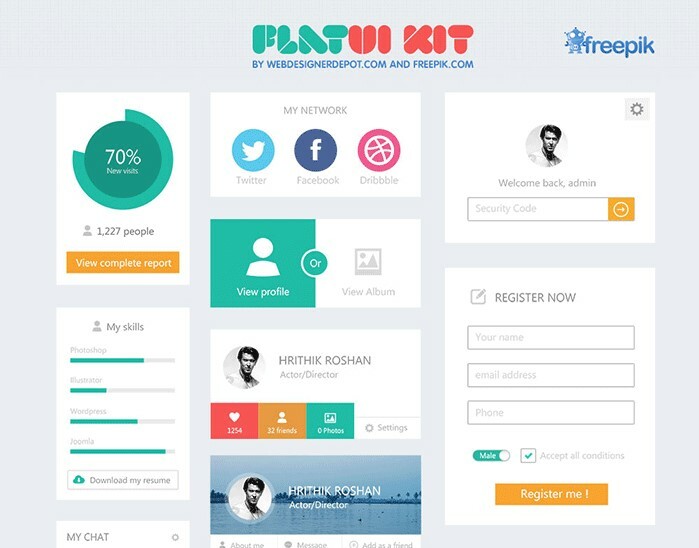 Riki Tanone’s Flat UI kit is a great example, showing a bit of pizazz in color selection. It’s not nearly as fully-featured as some of our other packs, but it’s more opinionated style might spark your inspiration for your next design. 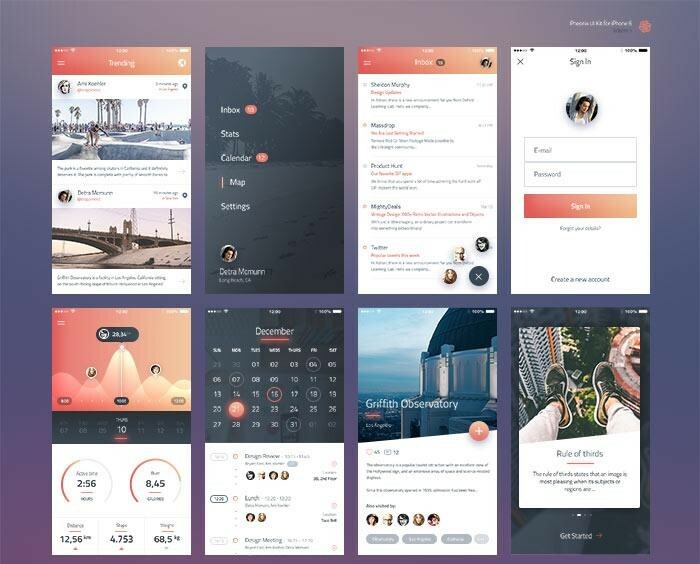 Devin Schulz’s Flat UI kit is another great Dribbble find. It’s short on color, but uses monochrome hues effectively. The kit is a little small, but considering it’s just a Dribbble shot, it’s a great way to get started on your design. Flat UI Kit by Piotr Adam Kwiatkowski is a minimal set of UI elements, but it offers great inspiration. It’s one of the few designs in this set to use subtle gradients effectively, giving a more vibrant look to what might otherwise be a fairly ho-hum layout. WebDesignerDepot partnered with well-known vector marketplace FreePik to create their Flat UI Kit. It’s amazingly dense, and it’s filled with the kind of professional features you’d expect from a pairing of two excellent companies. You’ve got profile pages, sign up forms, search bars, pricing carousels and more. It’s short on more basic elements, like buttons in different states, but the preset elements can be a big time saver for more complicated projects. Flat Design UI Components is a great pack for getting started with a “night mode” design. It skips the basics in favor of fully-fledged UI elements like calendars, weather widgets, profile pages and sign-in forms, as well as a charming photo of Anne Hathaway. Secret Spot HTML5 CSS UI Kit exudes freshness and modernity. It’s got a strong card-based layout, and it’s one of the few kits to come as a CSS3/HTML5 webpage rather than a PSD layout. If your prefer a PSD kit, you can get that here. Phoenix iOS UI Kit might be aggressively modern for some tastes, but it’s got no shortage of style. The gradient-style background elements are lovely, and it’s a pleasure to look at. It’s definitely for iOS development only, but it’s too attractive not to share. Blog/Magazine Flat UI Kit was designed with a very specific purpose in mind, and it shows. While the basic elements could be used for any designs, the pre-fabricated design elements are heavy on the modern blog look. This is a great place to start if you’re updating your WordPress template or designed a Bootstrap-based blog. The Noun Project isn’t a specific UI set, but a website that you can use to find specific UI elements. Designers upload free-to-use UI elements, and end users search the database to find what they’re looking for. There’s a wealth of free, flat UI elements available for the asking, and it’s especially useful if you’re seeing a generic or styleless layout.